Striking and unusual, the iconic design of the conical Legnoart multigrater is mirrored by this beautiful multimill, designed to sit alongside its venerable cousin. 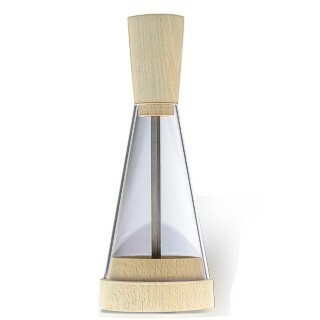 The base and top is made from solid natural side compressed bamboo with a natural waterbase finish and a ceramic grinding mechanism ensures clog free grinding throughout its long and productive life. This classic design is 20 cm high by 8 cm in diameter (8 by 3¼ inches approx) and can be used for salt, pepper or spices.